Nature’s Sleep is a company that has been producing mattresses for many years now, and we’ve got their newest offering lined up for a review. Meet the GhostBed, it’s a new foam mattress from Nature’s Sleep that offers a balanced feel that fits most sleepers. This is a strong effort from Nature’s Sleep, as any mattress that attempts to cater to everyone is a heavy lift. Should I Buy the GhostBed Mattress? The GhostBed is made from latex and memory foam arranged into three layers. This allows the mattress to offer better deep compression support for sleepers who have issues with pressure points or experience back and neck problems. The unique combination of layers and materials does a great job of providing some innovative and distinctive qualities that are hard to find in the GhostBed’s nearest competitors. Top – This layer is made from 1.5” of aerated latex foam. As a result it has an excellent bounce, and cools better than other mattresses that use latex foam for the cooling and comfort layer. Moreover, this material is excellent at relieving pressure points and has great responsiveness for a cool and comfortable night’s sleep. 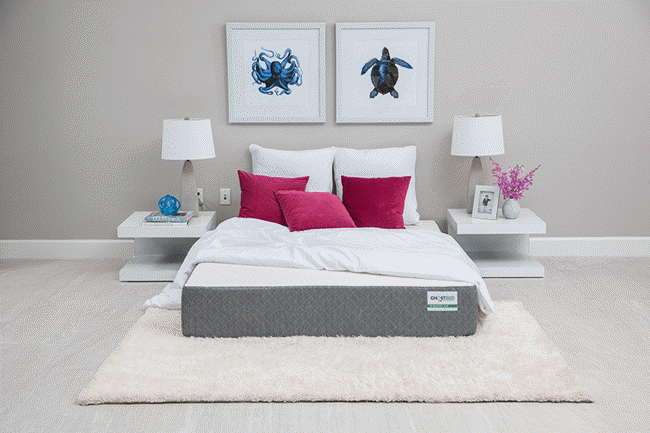 Middle – The middle layer is constructed from 2” of gel memory foam. This provides support, deep compression support, and great pressure relief. The gel memory foam layer is placed under the latex foam in order to maximize the responsiveness of the mattress. Moreover, the gel infusion in the foam helps this layer breath and keep cool. Bottom – The bottom layer acts as the foundation of the mattress. It is made from 7.5” of high density support foam, enhancing the qualities of the layers above it while providing a sturdy foundation that most sleepers will love. The cover of the GhostBed is made from 100% polyester. The qualities of polyester mean that the cover is very soft and stretchy, and it does a great job returning to its shape after being pulled or tugged on. This makes it easy to get clean fitted sheets on the mattress, and prevents the awkward feeling that can happen when you’re sleeping and pull a piece of the cover with you as you roll over or turn. The side panels are constructed from polyester and polypropolyne in a 51/49 ratio. The combination of these two materials helps provides great support for the mattress and give it a sturdy feel. The cover itself has a nice look to it. The fabric is very elastic, which gives the cover a solid look. The color scheme of the mattress is a two-toned grey and white design. Additionally, the cover has a zipper on the bottom, so you can remove it for cleaning if necessary. The GhostBed is a medium-firm mattress that is designed to be agreeable to most any sleeper. The only folks who won’t care as much for this feel are those whose preferences are at the extreme ends of the soft-firm spectrum. 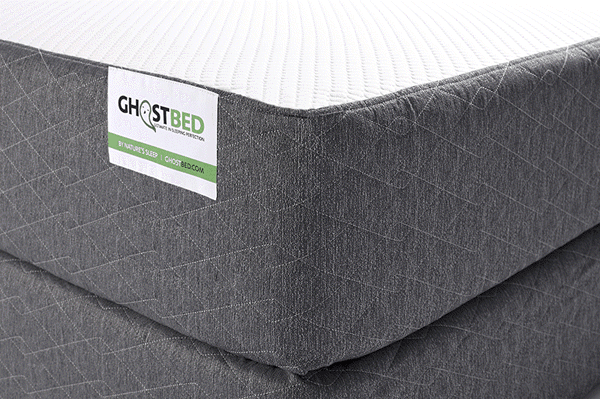 The GhostBed mattress has a very particular feel to it, a feel that isn’t replicated in similar mattresses. When you first lay down the mattress feels much more firm, but then feels softer the longer you are on it. This is a result of the unique combination of the latex foam, gel memory foam, and support foam. Moreover, the order and size of the layers also contribute to this, allowing heat to seep down to the memory foam, causing it to soften up where you need it most. Additionally, the breathability of the latex with the softer memory foam underneath lets you enjoy the benefits of heat sensitive memory foam without the drawbacks the material usually comes with. On a scale of 1-10, with 1 being the softest and 10 being the most firm, the GhostBed rates at about a 6.5. This means that it does a good job of meeting its goal of appealing to the vast majority of sleepers. It also does a great job of avoiding another issue that can hamper foam mattresses. Most foam mattress either provide a rapid response with minimal contour, or they have a deep contour but slower responsiveness. The GhostBed straddles this line, and provides the best parts of each material while avoiding the drawbacks normally associated with them. The GhostBed also does a great job when it comes to cooling. The aerated nature of the top layer of latex foam goes a long way in providing a breathable mattress that won’t accumulate and hang on to excessive heat over the course of the night. We didn’t have any issues with pressure points when testing this mattress, and its robust 11” thickness goes a long way in providing great deep compression support. We always test all mattresses for Sinkage. The tests are conducted using a subject who weighs ~140 lbs, so your results might be a bit different than our measurements, but they do a good job of giving you an idea about how much give the mattress has. Laying on back – we recorded around 1.25” of sinkage when laying on the back in a normal sleeping position. Slight edge sit – sitting on the edge but not putting the full body weight on it produced 2.5” of sinkage. Standing in middle – when standing in the center of the mattress we recorded 4.5” of sinkage. Something that’s important to note is that we made sure to give the mattress some time to adjust when getting our final results. This goes back to the fact that the GhostBed takes a bit longer to hug and contour, and feels firmer at first, so keep that in mind if you’re not getting as much sink as you expect when you first lay down. Nature’s Sleep has priced the GhostBed mattress to be competitive with many of the other foam mattresses we’ve looked at. You should know that there are plenty of deals and promotion offers online for the GhostBed, so look around and see if you can get a discount before buying, you might be able to save some money. Also, GhostBed mattresses are eligible for a 12 month, 0% financing offer so you can break the mattress’s payments down into more manageable numbers if you need to. The GhostBed sets out to be a mattress that all kinds of people will enjoy. The people that it’s best for are those who prefer a slightly firmer mattress. Keep in mind that the mattress isn’t as firm as it feels at first, as the second layer of gel infused memory foam takes a second to react to the body’s heat and temperature. Another group of sleepers who will get great value out of the GhostBed are those who enjoy the contour offered by memory foam, but want better top layer response. The interesting and unique combination of latex and gel infused memory foam in the GhostBed provides both of those qualities. The bounce and responsiveness of the latex prevents you from feeling stuck in or to the mattress, while the second layer’s memory foam provides the hug and contour that make foam mattresses so appealing. Moreover, the combination and construction of the layers mean that you’ll get more hug and contour the longer you sleep, which is a great way to provide support while also keeping you nice and cozy. The GhostBed is also a great choice for anyone who wants good support. People with neck or back issues. This is likely a result of the combination of responsiveness and contour provided by the different mattress layers. 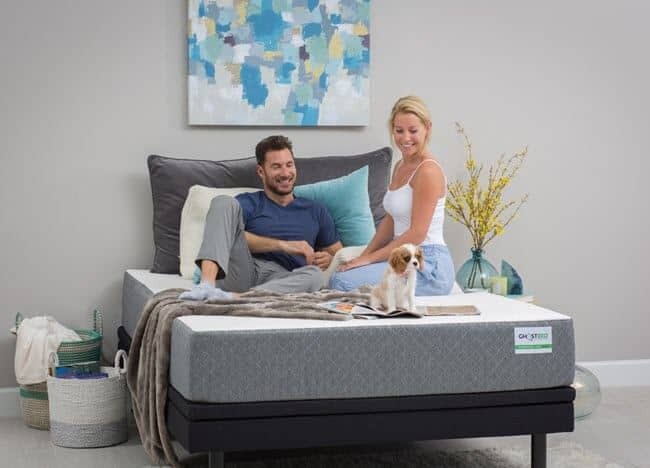 In fact, the support is even good near the edge, so if you’re an edge sleeper you can enjoy your rest without feeling like you’re going to fall or roll off the mattress. Finally, people who sleep hot and want a cooler mattress will love the breathability and coolness the GhostBed affords. The latex foam is aerated for great breathability and airflow, and the gel that is infused into the second layer of comfort foam allows the mattress to take advantage of all the qualities that material provides without trapping too much excess heat. 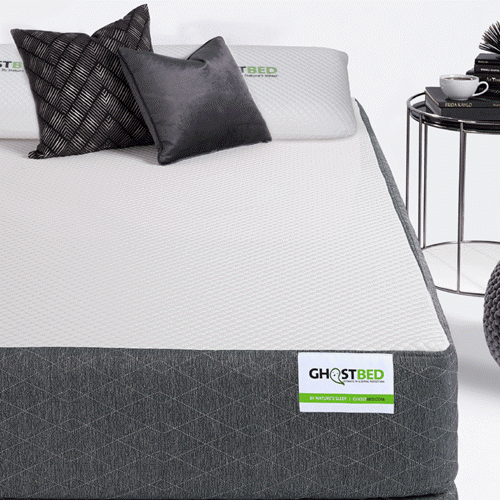 On the whole, the GhostBed offers greater support than many of its competitors. Moreover, with an additional .5” of comfort foam, the GhostBed delivers a quality night’s rest in a package that most people can afford. It has great responsiveness, hug, contour, and support. It also does a great job of relieving pressure points so that those with back or neck pain will be able to enjoy their sleep to the fullest. The latex and memory foam construction help the GhostBed meet the lofty goals it sets for itself, and therefore is a great value for most sleepers.